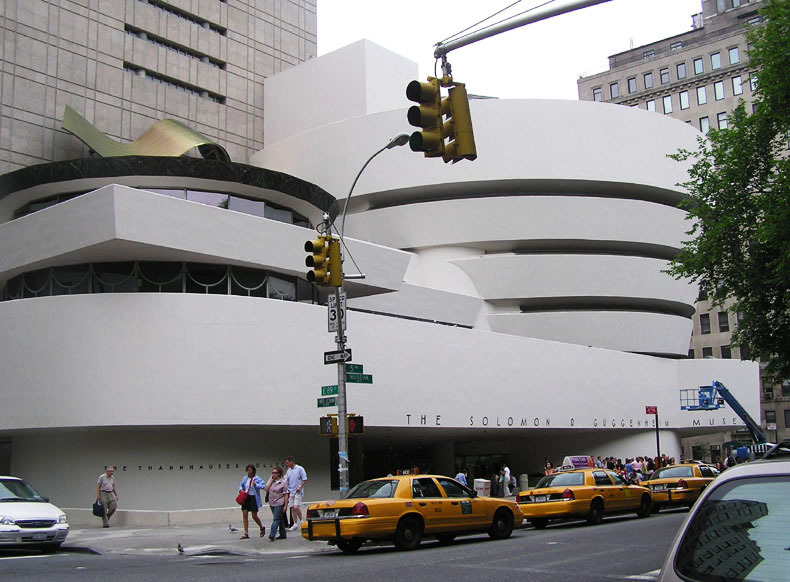 The Solomon R. Guggenheim Museum, often referred to as The Guggenheim, is an art museum located at 1071 Fifth Avenue on the corner of East 89th Street in the Upper East Side neighborhood of Manhattan, New York City. It is the permanent home of a continuously expanding collection of Impressionist, Post-Impressionist, early Modern and contemporary art and also features special exhibitions throughout the year. The museum was established by the Solomon R. Guggenheim Foundation in 1939 as the Museum of Non-Objective Painting, under the guidance of its first director, the artist Hilla von Rebay. 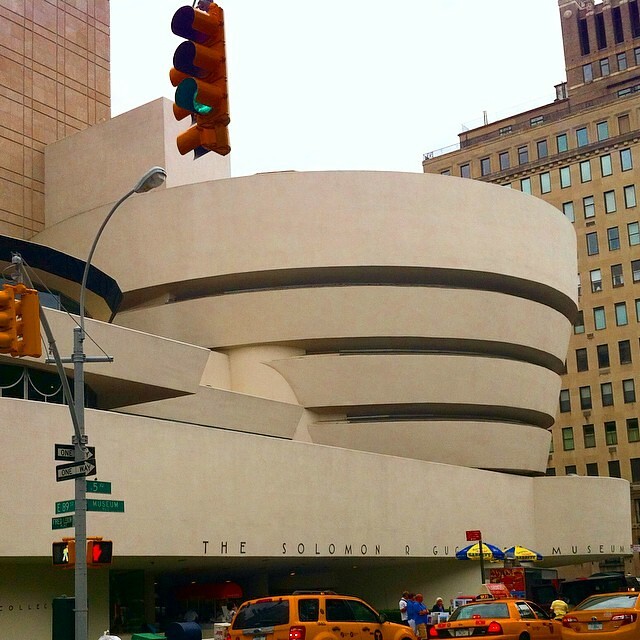 It adopted its current name after the death of its founder, Solomon R. Guggenheim, in 1952. In 1959, the museum moved from rented space to its current building, a landmark work of 20th-century architecture. Designed by Frank Lloyd Wright, the cylindrical building, wider at the top than the bottom, was conceived as a "temple of the spirit". Its unique ramp gallery extends up from ground level in a long, continuous spiral along the outer edges of the building to end just under the ceiling skylight. The building underwent extensive expansion and renovations in 1992 (when an adjoining tower was built) and from 2005 to 2008. 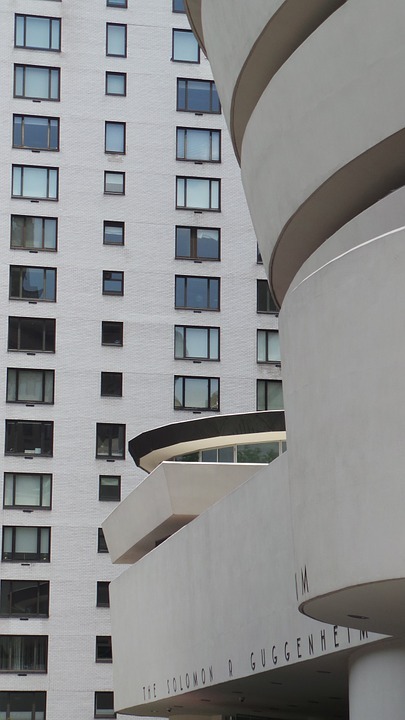 The museum's collection has grown organically, over eight decades, and is founded upon several important private collections, beginning with Solomon R. Guggenheim's original collection. The collection is shared with the museum's sister museums in Bilbao, Spain, and elsewhere. In 2013, nearly 1.2 million people visited the museum, and it hosted the most popular exhibition in New York City. Smaller than you may expect if you are seeing it for the first time. The spiral walkway is really cool and is the main draw of the museum beyond the art that is inside it. Once you walk to the top then you can walk down by visiting each floor, which has a section that comes out from the spiral. Makes sure the museum is fully open before you go. They shut down the spiral when they change exhibitions, and it really diminishes your experience. Very well know and talked about so i decided to give it a visit. It is nice for what it is. Lots if security personally I don't think it should have as much as it does . It doesn't have that much art in it. I think it's nice to visit to check it out but I will not be returning. They have special promotions for people who have certain credit cards at the beginning of the month call to see if your card qualify it will save you a lot of money as the entrance is pretty pricey. Enjoy! Amazing building inside and outside, designed by Frank Lloyd Wright. We went between 5-7.15 on a Saturday, to take advantage of the pay what you want scheme. We paid 7$ each but there is really no pressure to pay a specific amount. I recommend walking right to top, taking in the amazing view by looking back down to into the lobby and then walk slowly down sto take a look at all the art you walked past on the way up. It was a Giacometti exhibition on display in our case, recently moved from the Tate in London. Be sure to also check the galleries feeding off the central curve, as there is always additional art to the main exhibition on show. The only criticism is the staff were generally hostile, however this didn’t effect my sheer enjoyment of everything else I experienced, I’m looking forward to visiting its sister gallery in Bilbao. Sometimes the container usurps the contents, and in the case of the Guggenheim, the majority of the art did not impress me as much as the building itself. The building - exterior and interior - is absolutely remarkable and highlights Frank Lloyd Wright's genius. Besides the main atrium and spiral, check out the design elements of the Aye Simon Reading Room and even restaurant and furniture. The temporary (past) exhibit in April 2018 which occupied the main internal spiral was not much to my taste. The permanent Thannhasuer Collection was much more enjoyable for me with many impressionist artists' works. I spent about 2 hours at the museum with half focused on the wonderful building itself.